I needed some end of track bumpers to keep my rolling stock from leaving the sidings. There's a number of commercial products available, but they cost too much money or they take up too much room. 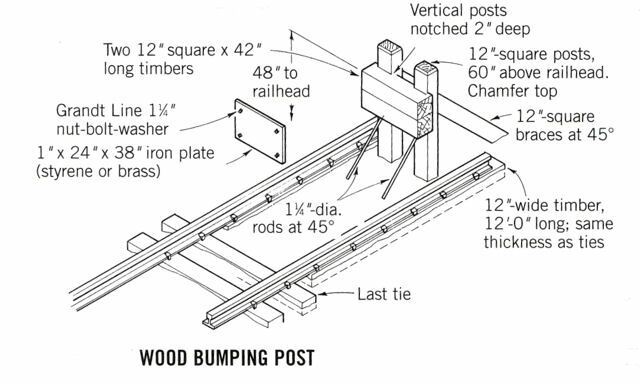 Kalmbach has a book "Trackwork and Lineside Detail" that provided a basis for my design. I modified the design a bit to make it easy to build. 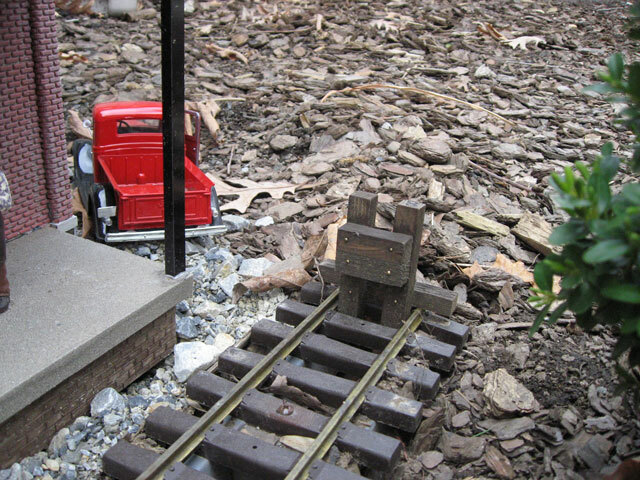 I didn't want to cut any diagonal pieces, and I also wanted to be able to firmly anchor it to the track. I used a combination of cedar and redwood, mostly because that's what I had in the scrap box. I started by building a template to make construction easier. 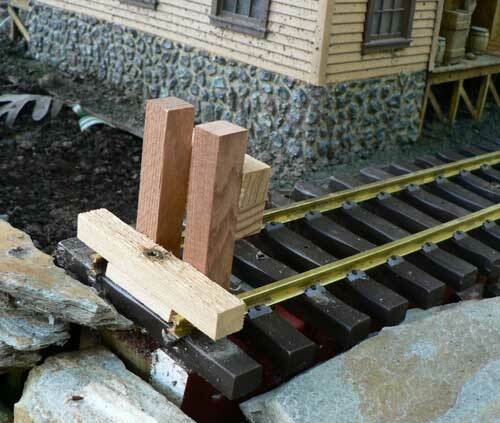 But, the first piece doesn't use the jig. I glued both of the 1/2" x 3/8" pieces together, centering the smaller piece on the larger one. This assembly is then placed in the jig. Next, the two 3" long pieces are glued on top of the base. Then, the two 1 1/2" pieces are glued in place on the top of the vertical supports. The pencil marks on the jig help me locate them to the correct position for the horizontal pieces. The six escutcheon pins are hammered in place. I also put a dark stain on the finished product. I thought about putting a "metal" plate on the front, like the prototype, but decided it really didn't add that much. I drill a small hole in the base (to prevent splitting) and then screw the assembly to the track using a deck screw. Add a coat of stain and it fits right in.